impact the ground in the roll over at Pikes Peak, yet we were amazed by how well it survived. The original aluminum mounts had bent into all sorts of shapes, and some of the mounting studs had either broken off to tore out from their threads. Since the airfoil was still structurally intact (for the most part) this seemed like the perfect solution! 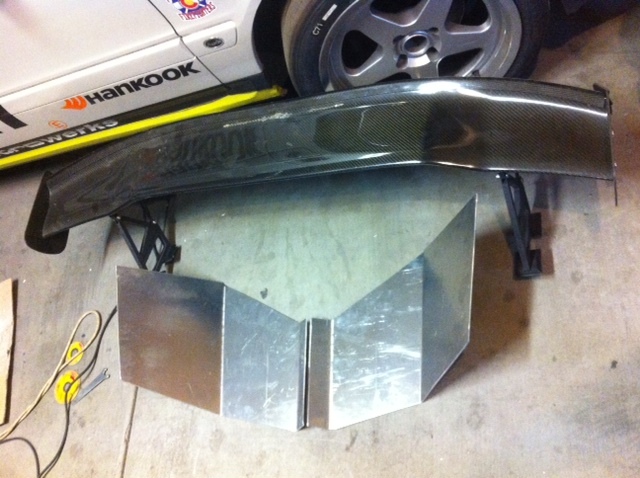 With a little CAD work, and some Aerodynamic analysis we designed some end plates that would also function as mounts. It was important to get a design where the angled portion of the wing plate was dead straight from the front view, yet followed the trunk line for proper mounting which made for some awkward angles. But that’s OK! Because we have an expert sheet metal fabricator on staff 24/7! Once the end plates were bent to the proper shapes, it was smooth sailing. Drill some holes to attack the airfoil, and drill some holes in the trunk to attach the full assembly. As anticipated, the wing was pretty flimsy once it was mounted; the end plates were stiff, but not stiff enough to keep the wing stable side to side. With some steel cables added to tension the assembly like an early aviation bi-plane wing, all the flimsiness went out the window, this thing is now solid as a rock!